The Automatic Rockstar is a new coaching program by Alex Chase that teaches guys social circle club game that is easy to implement. The Automatic Rockstar Coaching Program will show you how to automatically create a lifestyle that surrounds you with beautiful women and also build social circles within the club scene to maximize your results with less effort than you are currently putting forth. 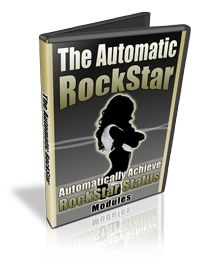 The Automatic Rockstar program includes a 6 week tele-coaching class along with numerous additional bonus videos, audio and ebooks. So click here to find out more if you are interested. I think the program sounds cool and the price is right… but what is up with the name?! Any product with the word “rockstar” in it makes me want to throw-up! Should You Use Gimmicky Props To Open Women?